Mrs. Wilkes: It's taken me ten years to get that damn war out of his head! Rhodes: Oh yeah? Well it looks like it's still in there to me. It has become almost a clich� in films to feature a war veteran character deeply affected by his experiences in battle, overcome by flashbacks and visions. Unfortunately, these people are no mere screen invention, as many men who faced combat suffer from the same kind of afflictions. It's difficult to imagine the pressures of war and the burden of those experiences. In Uncommon Valor, Jason Rhodes' (Hackman) burden is doubly heavy�not only does he battle with his own memories of combat, but with the loss of his son, MIA in Vietnam. After ten years of fighting treaties and bureaucratic red tape, he decides to take over the search for his son personally (and, necessarily, covertly and illegally). He recruits his son's old army buddies, those lucky enough to have survived, and the team prepares to conduct a rescue mission into the bowels of the Vietnam prison camps. The premise is an intriguing one; it speaks to many mythic ideas of men in combat. These men risk death in returning to Vietnam because they owe it to their friend, and they swore to never leave a man behind. Rhodes' commitment to his son overshadows that to his own life and livelihood. The injustice of the legal battles between warring governments has made the undercover mission a necessity, and the camaraderie and bond between the team members is perhaps the best aspect of the film. The characters, unfortunately, aren't all that complex. Most are given a single defining characteristic, which they stick to for the entire film, be it the jumpy guy who gets flashbacks or the cocky drill instructor. However, each actor gives a solid performance, and even if they don't feel fleshed out, these characters are always fun to watch, simply because they seem so natural. Of course, Hackman does his usual excellent work as the haunted Rhodes. It isn't one of his best performances, but he brings to it his usual sense of realism and grit. Despite the loosely drawn characters, some clichéd dialogue and a painfully slow first act, the problems with Uncommon Valor do not lie with the script. Once the men finally reach Vietnam, the pace picks up, and things get quite interesting. It is always clear what has to be done to accomplish the goal and rescue the prisoners, and that lends the latter part of the film a clear progression and a sense of momentum. No, the problems lie in Kotcheff's direction (and, perhaps even moreso, in Mark Melnick's editing). Much of the emotional core of the film is lost through bland, obvious direction. Specifically annoying were several "zoom" effects, where a character would be looking at a picture and the camera would quickly zoom in to a particular part of the image. Unless extremely well utilized, such a simple technique really can look bad on film, and such instances give this the feel of a "movie of the week." The editing is also extremely choppy, with quick, ungraceful, and illogical cuts from scene to scene. 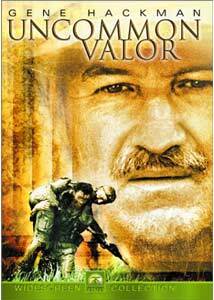 Uncommon Valor has become a rental favorite over the past 20 years, and it does have its admirable aspects, including some great acting, a compelling plot, and some nicely graphic action scenes. However, it never feels like anything more than a big budget TV production. Image Transfer Review: Paramount tends to do excellent work with their catalogue titles, and Uncommon Valor is more or less up to their usual standards. As with many 1980s films, this one shows quite a bit of film grain, especially in the darker scenes. Overall, the black level is only passable, with some scenes looking a bit murky. Color quality seems to vary from scenes to scene, with some looking nicely saturated and others a bit faded. Most of the problems seem to stem from the print used for the transfer which, aside from the grain, exhibits a few scratches and lines as well. Audio Transfer Review: In addition to the original 2.0 mix, Uncommon Valor has been granted a new 5.1 remix. The front soundstage carries most of the action, and while it does feature some directionality, it still feels quite narrow. The surrounds open things up a bit in the action scenes, even using split-effects here and there, but nothing overly impressive. There is a notable lack of bass, and the only thing that seemed to really feature any lower frequencies at all was the score. This is a better than average remix track, and it works within the limits of the source material. The 2.0 track is comparable, minus the split-surround effects and the limited use of bass. Extras Review: Aside from English subtitles (which aren't really an extra in my book), this one includes nothing, not even a trailer. While fans of the film may be disappointed, I can't say I find this too troubling, as not every disc can be a special edition, and this film is pretty average on all fronts. Still, that doesn't excuse a ridiculously high $29.99 price tag. Honest performances and an interesting premise somewhat redeem this film, but Uncommon Valor just can't seem to overcome its one-dimensional characters and ham-handed direction. Coupled with the high price and lack of supplements, I'm afraid this one looks like a rental.